Movie: "The Da Vinci Code"
Professor Robert Langdon (Tom Hanks) becomes the main suspect in the murder of his friend and colleague. Meanwhile, with the help of the victim's granddaughter Sophie (Audrey Tautou), Robert investigates clues that unravel the mystery of the Priory of Sion and discovers the secret that led to the death of his friend. "The Da Vinci Code" is directed by famed director Ron Howard, who has graced the cinematic world with such films as "Apollo 13," "A Beautiful Mind," and "Frost/Nixon," as well as several others. This film is based on the best selling novel of the same name, which is written by Dan Brown. It stars Tom Hanks as Professor Robert Langdon, an expert in historical symbols. When his friend Jacques Saunière, played by Jean-Pierre Marielle, is murdered in the Lourve, the lead investigating officer Captain Bezu Fache, played by Jean Reno, is sure Langdon is the culprit thanks to a tip from a Bishop of the Opis Dei, a strictly devout sect of the Catholic Church. Saunière, however, left some clues behind that shed a light of why he was killed. Now, with the help of Saunière's granddaughter Sophie, played by Audrey Tautou, Langdon must uncover the secret that got her grandfather killed. Joining them are the likes of Paul Bettany, Ian McKellen, and Alfred Molina. With Ron Howard directing this film, Tom Hanks starring in it, with such a strong supporting cast, and with source material like Dan Brown's acclaimed novel "The Da Vinci Code," one would expect this adaptation to be fantastic. Unfortunately, it winds up being a very middle of the road dramatic mystery crime thriller. Tom Hanks walks around Europe while Audrey Tautou discovers random clues and spouts lines of exposition to the audience. McKellen eventually comes into the picture and offers some more exposition as far as the uncovering of clues goes, and he also gives detailed explanations of the theories that will unravel this mystery. There is a lot of jargon and talk about the Priory of Sion, the knights Templar, and supposed members of the Priory like Isaac Newton and Leonardo Da Vinci, and of course, constant talk about murder victim Jacques Saunière. Meanwhile, they are being pursued by religious zealot and the actual murderer Silas, played by Bettany, who is trying to protect a secret that could destroy the Catholic church and shatter religion as we know it. While we enjoy this notion, the execution and explanations are too convenient to the plot. 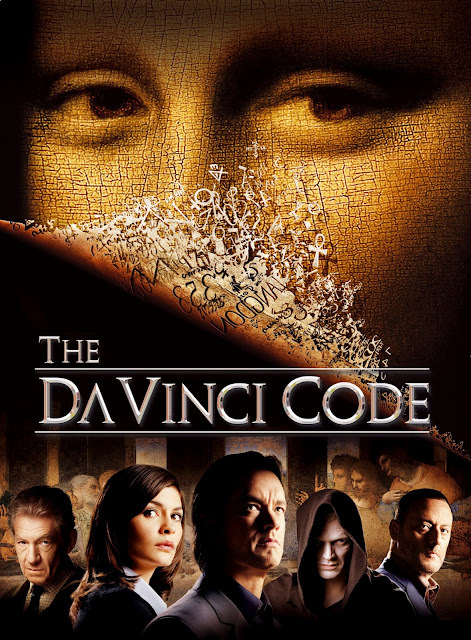 Don't mistake us, "The Da Vinci Code" isn't a bad movie, but it could be a lot more compelling than it is. It also feels a bit overly long and unnecessarily convoluted, as if there are moments that could have been shaved of to make the pacing a bit faster and the plot a bit less chaotic. Much of the dialogue is convenient to the plot, which never really makes this a guessing game so much as a "wait and be told my Hanks and Tautou" game. The acting is solid enough. Come on, is Tom Hanks ever bad? Even in a mediocre movie, he acts circles around sub-par plots. Audrey Tautou is also great, though it sounds like she's never 100% comfortable within the context of this story, or with speaking English. Paul Bettany, Alfred Molina, and Ian McKellan are excellent as well, as it should be with a cast of this caliber. We just don't find the story as engaging and enthralling as we would have liked. The film overall hasn't completely stood the test of time, and we remember liking this film a bit more when it first came out.